Compugen Education is the education resale arm of Compugen Inc, an IT services company based in Richmond Hill, Ontario and Houston, Texas that does more than $600M in business each year. For more than 30 years, Compugen has defined the advanced resale market in North America, offering certified ISO9001:2008 services that go above and beyond for its education clients. It’s hard to imagine a classroom in this day and age that doesn’t have a computer in it. But all too often, the technology in classrooms is out of date, low quality, and in poor working order. Compugen Education has been on a decades-long crusade to improve technology in the classroom. Providing better computers for education clients at a lower price point has been our singular mission. We’re able to offer consistently high quality computers for education clients because of our unique position in the market. As a large IT company, we have a steady supply of off-lease computers coming back from our enterprise portfolio. These computers have been used exclusively in controlled, professional environments and have been monitored and maintained by us. So we know exactly what we’re passing on to our education clients: the latest and most reliable education technology. 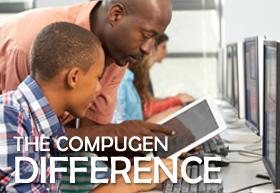 Compugen Education offers a full warranty on all hardware. If you experience a failure due to hardware problems, call us and we’ll put a new unit in the mail. Return shipping for the defective unit is on us. It’s all part of showing you how we stand behind the work we do. In this industry, wasted time and extra hassle are unacceptable. We simply don’t have the resources to waste. That’s why we’ve committed ourselves to constantly improving our customer service areas. Through high-level configuration management, we can track all the machines in our database in a matter of seconds. All too often, education technology companies are so focused on the bottom line that they forget the bigger issues. At Compugen, we’re dedicated to sustaining the environment and giving back to the community through our Green4Good program. Our Green4Good program keeps technology out of landfills and in the hands of those who most need it. Find out how we recycle old computers in order to offer new and refurbished machines for communities in need. Our facilities in Richmond Hill, Ontario, constructed in 2010, utilize state-of-the-art environmental technology including water repurposing, automatic lights, low flow toilets, follow-me printing. It’s all part of our commitment not just to education technology, but also to technology that sustains our planet.